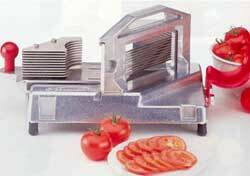 The ideal tool for volume cutting of tomatoes. Safe, fast, accurate slice, easy removal of top/bottom. Cast aluminium body with stainless steel blades.